The latest addition to the busy streets of Bandra is The Chimney Factory that is serving the street food of Hungary. Would you not be tempted if someone told you that all your food – sweet and savoury – is all being served in cones? Sounds super convenient, right? The Chimney Factory, or TCF, offers an array of cone-food flavours, 22 varieties to be precise, to choose from. This wide range includes sweet options such as Tasmanian devil, Vietnamese coffee, nostalgia cone which all have fillings like vanilla soft serve, candy floss, red velvet, and toppings such as orange praline sauce, caramelised orange, chocolate sprinkles and more. In the savoury world, the options include paneer bhurji, chhole masala, Italian mama rosso, and Mexican cones. To have something for everyone, they even do Jain cones with spinach and corn. Highlight? They have glow-in-the-dark cones to add that extra zing to your food. For drinks, they have the classic milkshakes like oreo, banana and peanut butter, tiramisu cheesecake, and kulfi elaichi. If you’re looking for something more refreshing, try their coolers with flavours like elderflower, popcorn and red berries. Why not try a new cuisine when it’s opened its doors right next to you. 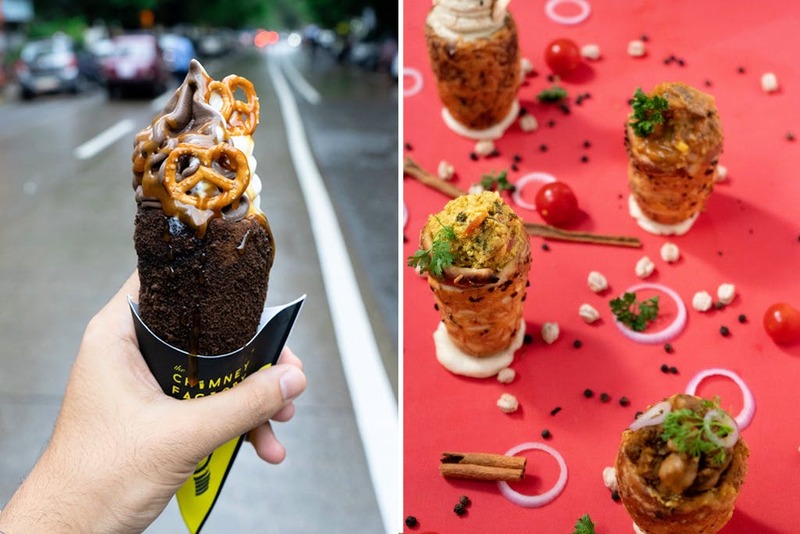 The Chimney Factory in Bandra is all set to be your next go-to place for quick bites.